The Long Haul Investor: Is Sugar A Bad Investment? I've been thinking about the danger's of sugar a lot lately as I try cutting down my own consumption to shed a few extra pounds for summer. It's no secret that consuming sugary drinks, and especially sugar laden foods are bad for your overall health. 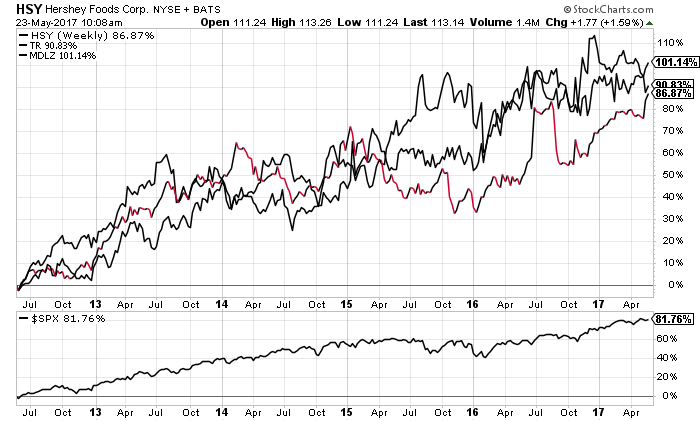 I decided to look at the performance of Tootsie Roll(TR), Mondelez(MDLZ), and portfolio member Hershey's(HSY) versus the S&P 500. All three manufacture candy, and other snack related foods. As we can see each have outperformed the index over 5 years. Although this doesn't include dividends, but I don't think that would change much since each company is a consistent dividend payer. It seems market hasn't caught on yet to what the rest of society knows. Or at least what they think they know.